The exhibition, curated by Sali Oelhafen, can be viewed at the Munich location until October 2019 by appointment at +49 89 383 46 151. Art critics like to compare the effect of his pictures on the viewer with a stage situation on which a play takes place. Franco Kappl himself describes his style as “gesturally abstract. As a painting that peels amorphous forms out of the canvas.” Until October 2019, visitors to for​you​and​your​cu​sto​mers Munich can get their own impression of Franco Kappl’s work. Franco Kappl’s abstract paintings are stages with intensive performances. 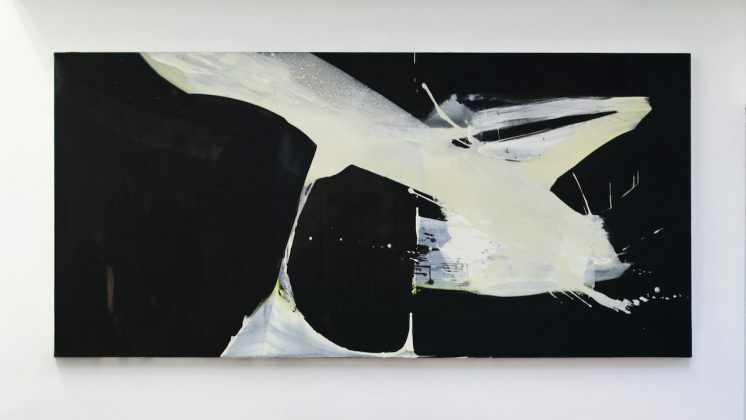 Black paint creates space for a moving staging of painting: brightly shining – sometimes glistening, sometimes pensive – breakthroughs occur inside the picture, kidnapping into depths or formations that throw themselves into space, seem to grow out plastically. The white suddenly meets the dark, enjoys a strong appearance: expressive, dynamic, in wide colour swings, and then fades away, with a thin brush, graphic. Like dance, maybe? Music? Yes, and pompously, with fanfares! And just as quietly, in transparent streaks, dripping… And everything remains visible: the working process, the varied brushstroke, contrasts and breaks. Intention and chance. So every screen becomes a new adventure, a new journey.